The struggle of a man against disease and death is as old as the history itself. On the basis of skill, knowledge and practices based on the theories, beliefs & experiences indigenous all civilizations has developed their own treatment system which is now called as traditional treatment system. The base of almost all such treatment system is plants. Various as scholar and medical men, since the vedic period dawn to the present century, have contributed a lot on the use of medicinal plants in health care. Plants are the most ancient source of drugs and the plant based medicaments, the countrymen’s prime therapeutic weapon, are still is front line today for treating a large number of diseases. According to Professor N.R. Fransworth the plants are “The sleeping giants of drug development today and will represent in future as first class source for new medicaments. The most established traditional system is Ayurveda. The objectives of Ayurveda are Dhatu Samya, Swastha Vritta and Atura Vritta. Proper cure of a disease entirely depends upon rational interaction of four limbs of therapies or chikitsa chatushpada and drug is one of the components of therapy. The material Media of Ayurveda is very vast. It comprises of Plants, animals and metals and aquatic products but plant drugs occupy a large area for the prevention and promotion of health and treatment of Disease. It may be noted that Ayurveda (sanskrit Ayur : life, Veda : science, Knowledge) is the ancient Indian system of health management which is still widely practiced in the sense of “holistic’ approach, especially for metabolic disorders. Ayurvedic medicines are mostly based on plant materials. The entire mountainous region of the country is considered a vast repository of medicinal herbs. It has been estimated that the sources of 80% Ayurvedic medicines are found in the western Himalayas. A medicinal plant is any plant which is one or more of its organs substances that can be used for therapeutic purposes or which are precursors for chemo pharmaceutical semi-synthesis. The definition makes it possible to distinguish between the medicinal plants that are already known whose therapeutic character or a precursor of certain molecular have been established scientifically and the other plants which are regarded as medicinal but have not yet been subjected to thorough scientific study. Researches for the identification, development and utilization of plants should be given high priority for the development of Indigenous system of health care in order to reduce drug bills and develop more acceptable and more readily acceptable to the people and with better coverage. Psychotropic drugs : A group of drugs which have been observed as medhya drugs and few others have shown to have definite action on brain called as psychotropic drugs e.g. The drugs have a true tranquilizing effect on brain without inducing any hangover or dullness of brain. These are helpful in inducing sleep and freshness of brain for better performance, thus improving the intellectual activity and memory also. 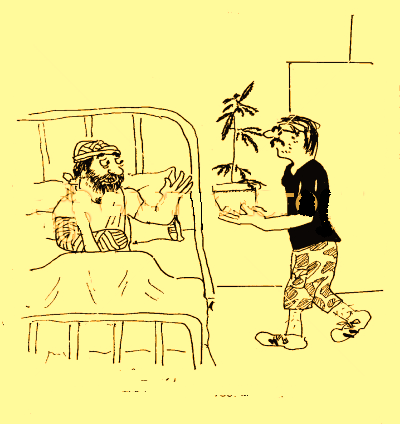 These plants also help as to come out of severe complexes, depression and antisocial trends e.g. suicide, hemisuidal, homicidal etc. Thus a good number of cardio vascular drugs are in our urmamentorium of medicinal plants which can be developed as potent drugs in future. According to Ayurveda respiratory system is the chief site of Kapha hence the disease also produce the symptoms of Kakha. Vata is also involved simultaneously in some disease as Bonchial Asthma. It is a well-known fact that if is a disease having ofstruction branch opathy. Obstruction may be because of the Oedoma/ inflammation of the mucosa or due to bronco – construction, forma is allergic inflammation due to excess of histamine like substances and the latter is because of the predominance of anticholenergic substance. Allergic manifestatias may produce several symptoms of respiratory tract disorder e.g. Allergic Rhinitis, Nasopharongitis Brynchitis etc. The following drugs have been found to be useful for amelioration of the above pathology. 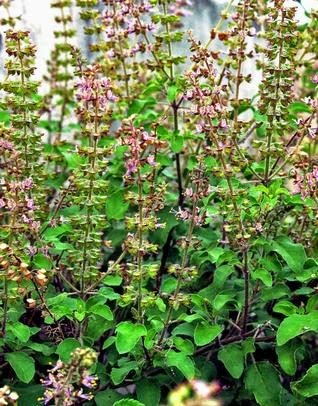 Tulsi is supposed to be most pious plant in Indian culture. No worship is complete without offering the tender leaves to God and then same is distributed among the masses for beneficial effect on health. The evidences are in favour that it is an immunostimulant thus providing increased general resistance for the prevention of disease. It is antipyretic, antinflamatery, expectorant and milid bronchodiloty thus of great help to the patient of upper respiratory and bronchial disease. Sirisha is known as an established drug for allergic disorders and branchal asthma. Charak has described it to be most effective vishghna (antitoxic drug). On Pharmacological study it is found to be antihistaminic and steroidogenc, plasma cortisol is increased within a week after the administration of the drug Active Principle is known to be a Saponin. All above drugs may be used alone or in combination for the treatment of several types of respiratory system disease. Shirisadi compounds containing Shirisha, Kanthari, vasa and Madhyuasthi is popularly used as shiristi chey (tea). Sunthi. Gastro – Intestinal: Statistics is evident that the incidence of gastro intestinal diseases in India is maximum. Broadly these can be classified in two groups (i) psychosomatic disease (ii) parasitic infection and a third group can be idiopathic. Among the first group peptic ulcer (parionon shula) irritable bowel syndrome and colitis are the common clinical entities available in our country. Ion the second group amoebiasis, giardiass and other worm infections are common e.g. round work, Hook worm, thread worm. There is a concept of Jatharagni in Ayurveda. Apart from that it also seems to help the absorption and metabolism. In case of hyperseoretion/Hyposecreation absorption becomes poor and the metabolism registers at a lowereble. So the malsecretion and malaobsoption syndrome are related to each other and produce several disease of G.I. tract which are often known as adiopathic e.g. Amlaphita, graham etc. Most of these drugs stimulate and digestive and help in regeneration of villi for a better absorption which leads to acceleration of metabolism. Some of the drugs are proved to be antihelimenthic and antiparasitic others offer symptomatic relief to the gastro intestinal symptoms. The most common disease of liver is infective hepatitis (kamala) Though it is a fact that it is a self limiting disease and takes about 4 weeks to become alright but it has got a very deterimented effect on health, if the pathology continues come residual symptoms perrists it may turn into cirrhosis of liver which is fatel in due course of time. Otherwise of the infection is fulminating it may take acute turn and patient may pass towards acute hepatic failure characterized by anasarca, hemorrhage, renal and curdic failure and the patient may succumb in no time. Even in the normal course of the disease there can be four stages on the first week there is no jaundice, there is fever and loss of appetite and general weakness usually the cough and cold may be present with the beginning of the process. In the second week Jaundice is marked urine, stool, skin, nails, eyes everything becomes yellow, in the third week there may be inflammation of file canaliculi colangitis leading to intrapepaic obstruction and regurgitation of file in the blood producing a more deep Joundice and whiteclay colourd stool, in the fourth week the pathology may resolve or pass to the stage of complication. Otherwise also, it the resolution is not complete the lesion may perrist as residual pepatitis. The following drugs hae been found to have a cholaratic effect and helping in the complete resolution of hepatitis, so these drugs have preventive as well as curative effect in patients of hepatitis. In clinical trial all these drugs in combination or as single drug can be used kalmegha and Amalaki combination are under clinical trial in our medicinal plants unit serum bilirubin comes down to normal range within to 2-3 weeks hepatitis is improved and there is no chance of having residual hepatitis in the end. The discussion could be extended to any length but it is concluded with an optimistic note that India with its rich heritage of herbal medicine, its wealth of medicinal flora and necessary expertise in all relevant area would be able to offer leadership in the development of herbal medicine. It should, however be kept in mind that tomorrows citizens of India will have a better scientific temper and attitude and will not be satisfied to know merely that it works they will question how it works? Our development should be equipped to answer this questions. top Clinical research companies and pharmaceutical and biotechnology industries.